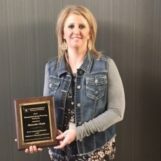 FARGO, N.D. (NewsDakota.com) – The 133rd annual ND Pharmacy Convention was held April 19-22nd in Fargo, where Valley City hospital pharmacy technician Amanda (Mandy) Chase was named the 2018 ND Distinguished Young Pharmacy Technician. Each year one outstanding technician is given this award for North Dakota, as nominated by his or her peers and chosen by the NAPT (Northland Association of Pharmacy Technicians) Executive Board. The award recognizes one pharmacy technician who has been working for 10 or fewer years, for his/her contributions to the profession. Mandy’s pharmacist peers were very complimentary of her daily work life, saying “her passion for her profession is evident daily in the interactions we have with her. To me there is not a technician in ND that is more deserving of this award” said Karen Finck of CHI’s Virtual Health tele-pharmacy group. Her hospital work colleagues also described her as “a very active and positive leader in our facility” and note that she is a strong advocate for patient and employee safety by being one of the hospital’s leading Safety Coaches. In this role she models and promotes our Safety First behaviors and is never afraid to mentor those who need assistance. Mandy has also done great work in sourcing medications through trying times of drug shortages. “I do not know of a nurse in this building who does not rely on Mandy’s skills, her integrity and her knowledge” says Keith Heuser, CHI Mercy Health’s President. Mandy Chase has been an employee at CHI Mercy Health since 2009.